Virtual World Games Like OurWorld For Teen & Tweens '+g+"
Check this list of recommendations for games like ourWorld which offer similar virtual world experience. 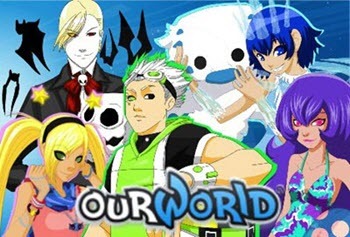 ourWorld is a virtual world game aimed at the teen and tweens by FlowPlay. The players can create an avatar and have their own customizable condos. ourWorld contain a range of online games and activities which rewards the players with Flow game currency that can be used to buy clothing, furniture, and everything else players need for their virtual life. Don't forget to mention if we miss any games similar to ourWorld as we keep on updating this list. WeeWorld is an avatar-based massive multi-player online social network where the avatars are called WeeMees which are cartoonish in nature and are only 2-D. In WeeWorld users can communicate with other WeeMees, explore the community, as well as play games that inspire social creativity and participate in quests. Meez is the online virtual playground for teens to create social and multimedia activities to share with friends. Users also can create a personalized avatar for use both in Meez's Virtual World and other online social networks. It is meant to be a virtual three dimensional representation of the user. SmallWorlds is a unique and rich virtual world game for teens that can integrate with Web 2.0 services such as YouTube, Flickr, SoundCloud etc,. The players can create their world, customize rooms, play games, watch YouTube videos, browse Flickr photos, grow exotic plants and much more to have an endless supply of fun. Club Penguin is a massively multiplayer online game (MMO) involving a virtual world containing a range of online games and activities, created by New Horizon Interactive. Players use cartoon penguin-avatars and play in a winter-set virtual world. Zwinky,...if you can think of more games, then don't forget to mention it in comments.